_Since the signing of Te Tiriti o Waitangi/Treaty of Waitangi Te Rarawa hapū have sought redress for their grievances against the Crown. Generations of Te Rarawa people over more than 170 years have carried the responsibility for seeking redress. This has placed a heavy burden on the whānau and hapū of Te Rarawa and impacted upon the physical, mental, spiritual and economic health of the people. Te Rarawa leaders have lodged dozens of petitions to the Crown over a very long period of time in relation to the loss of their land and control of resources. They began petitioning the Crown over surplus land issues in the nineteenth century and continued to do so into the twentieth. Te Rarawa participated in commissions of inquiry set up to look into grievances about land issues including Tangonge and Motukaraka. They also sought recognition of and redress for other grievances such as the Crown’s acquisition of timber and other resources at Warawara and Waireia, the Crown’s administration of Māori land in the twentieth century including Te Karae, reclamations, and roading issues, and the distress of the descendants of Maraea Te Awaroa Heke whose protest led to imprisonment on survey charges. In 1986 the hapū of Te Rarawa formed Te Rōpu-ā-Iwi o Te Rarawa. Over a period of years this led to the establishment of Te Rūnanga o Te Rarawa which was formally constituted in 1990 by all the marae of Te Rarawa. In 1986, following the amendment of the Treaty of Waitangi Act to allow for claims dating back to 1840, Te Rarawa and many of its hapū began to lodge claims with the Waitangi Tribunal. The Muriwhenua Claim known as WAI 45 was lodged in 1987 by the five Iwi of Te Hiku o Te Ika and Te Rarawa was represented by Simon Snowden. The area of interest for the Muriwhenua Claim ended at the northern side of the Whāngāpe Harbour and excluded the Hokianga. A claim for Te Rarawa ki Hokianga was brought together under the leadership of Dame Whina Cooper and this was known as WAI 128. It was lodged in 1990. __Between 1986 and 1988 the Tribunal heard the claims of Te Rarawa and the other Iwi of Muriwhenua. The Tribunal focussed on the fisheries aspect of the claims and released its Muriwhenua Fisheries Report in 1988. It found the claims of the Muriwhenua Iwi in relation to fisheries were well founded and made a range of specific findings regarding the Crown’s breaches of the Treaty. The Crown and Māori subsequently negotiated commercial fishing rights and interests leading to a deed of settlement in September 1992 and legislation to give effect to the settlement was passed later that year (the Treaty of Waitangi (Fisheries Claims) Settlement Act 1992). The Waitangi Tribunal heard the land claims of the Iwi of Muriwhenua over fifteen weeks commencing in August 1990 and concluding in June 1994. In setting the boundaries for its inquiry, the Tribunal adopted the then Mangonui County Council boundaries which stretched at the southern limit from the headwaters of the Herekino Harbour in the west to a point north of the Whāngāroa Harbour in the east. This excluded Te Rarawa claims between the Whāngāpe Harbour and the northern shores of the Hokianga Harbour. In all, the Muriwhenua claims are about the acquisition of land under a show of judicial and administrative process. They concern Government programmes instituted to relieve Māori of virtually the whole of their land, with little thought being given to their future wellbeing or to their economic development in a new economy. There is little difference between that and land confiscation in terms of outcome, for in each case the long-term economic results, the disintegration of communities, the loss of status and political autonomy, and despair over the fact of dispossession are much the same. The Tribunal has not inquired into the events after 1865. In 2002 a member of the Tribunal (Dame Evelyn Stokes) reviewed the evidence on the post-1865 claims. Her report (‘The Muriwhenua Land Claims Post 1865, Wai 45 and others’) identified a wide range of additional issues and was intended to assist claimants and the Crown to negotiate a settlement of their outstanding claims. The Te Rarawa ki Hokianga claims have not been heard by the Waitangi Tribunal. However extensive research into these claims has been undertaken and several research reports have been released. In 2001 Te Rūnanga o Te Rarawa sought a mandate from its people which included a decision to unite the Te Rarawa ki Hokianga and Muriwhenua claims as they related to Te Rarawa interests, and to go into direct negotiations. The mandate was given by the marae in 2001. 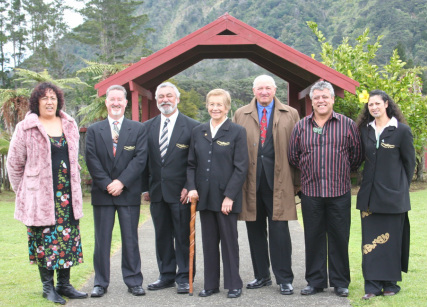 Te Rūnanga o Te Rarawa established a process for the election of a Negotiations Team in 2002 and Joseph Cooper, Paul White and Haami Piripi were elected as negotiators by the marae in May 2002. Terms of reference were drawn up to guide their activities and Rūnanga Chairperson, Gloria Herbert, and CEO, Kevin Robinson were co-opted into the Negotiations Team accordingly. With the retirement of Gloria Herbert as Rūnanga Chair in 2007, Acting Chairperson, Malcolm Peri was co-opted into the team. The team was supported by historian, Dr. Aroha Harris, claims manager, Catherine Davis, and legal advisor, Janet Mason. In March 2002 the Crown recognised the mandate of Te Rūnanga o Te Rarawa to negotiate all Te Rarawa’s historical Treaty claims. In December 2002 the Crown and Te Rarawa signed Terms of Negotiation. After more than five years of negotiations the Crown presented a cultural and commercial redress offer to Te Rarawa on 8 March 2007. On 14 March 2007, Te Rarawa met with the Minister in Charge of Treaty of Waitangi Negotiations and the Minister of Finance to formally respond to the offer. Following this meeting, the Minister in Charge of Treaty of Waitangi Negotiations made a revised settlement offer to Te Rarawa on 4 April 2007. An Agreement in Principle was finally signed between Te Rarawa and the Crown at Waipuna Marae in Panguru in September 2007. Progress towards a deed of settlement was difficult with all neighbouring Iwi being at different stages in the process. 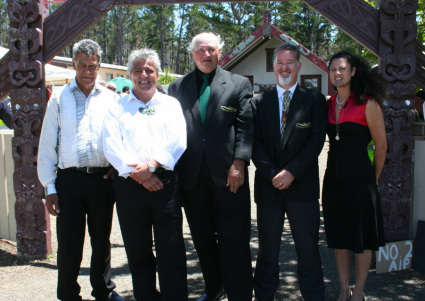 In June 2008 all five Te Hiku Iwi were involved in the establishment of the Te Hui Tōpu o Te Hiku o Te Ika Forum to progress shared and overlapping interests. Each Iwi appointed three negotiators to represent them on the Forum. Te Rūnanga o Te Rarawa appointed Haami Piripi, Malcolm Peri and Paul White as its representatives and in August 2008 the Forum and the Crown agreed a number of principles to underpin a fresh round of collective negotiations. Over time the scope of the collective negotiations between the Forum and the Crown widened to include settlement quantum and the return of the lands and properties held by the Crown in the Te Hiku area of interest. However, each Iwi also continued to have their own separate negotiations in relation to their cultural redress. On 16 January 2010, following intense negotiations between the Crown and the Forum the five Iwi signed an Agreement in Principle with the Crown that recorded that the Te Hiku Iwi and the Crown were, in principle, willing to enter into a deed of settlement on the basis of the Crown’s proposals recorded in the Agreement in Principle. Te Rarawa gave Te Rūnanga o Te Rarawa trustees a mandate to negotiate a deed of settlement with the Crown by deed of mandate in October 2001. • since the Te Rarawa agreement in principle and the Te Hiku agreement in principle, have had extensive negotiations conducted in good faith; and negotiated and initialled a deed of settlement. Now the Deed of Settlement has been initialled it is necessary to run a process of consultation called ratification. Information has been circulated to all affiliated Te Rarawa Iwi members and a series of hui will be run in late January and February to explain the settlement offer. There will be a four week voting period opening in January and ending on February 25th, 2012.